The easiest way to start grouping substances is by comparing their physical properties. Let us study this with the help of the following activities. For Activities 3.1 to 3.6, collect the samples of following metals – iron, copper, aluminium, magnesium, sodium, lead, zinc and any other metal that is easily available. Take small pieces of iron, copper, aluminium, and magnesium. Try to cut these metals with a sharp knife and note your observations. Hold a piece of sodium metal with a pair of tongs. CAUTION: Always handle sodium metal with care. Dry it by pressing between the folds of a filter paper. You will find that metals are generally hard. The hardness varies from metal to metal. You will find that some metals can be beaten into thin sheets. This property is called malleability. Did you know that gold and silver are the most malleable metals? The ability of metals to be drawn into thin wires is called ductility. Gold is the most ductile metal. You will be surprised to know that a wire of about 2 km length can be drawn from one gram of gold. It is because of their malleability and ductility that metals can be given different shapes according to our needs. Can you name some metals that are used for making cooking vessels? Do you know why these metals are used for making vessels? Let us do the following Activity to find out the answer. Take an aluminium or copper wire. Clamp this wire on a stand, as shown in Fig. 3.1. 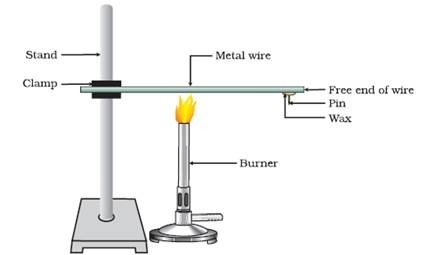 The above activity shows that metals are good conductors of heat and have high melting points. The best conductors of heat are silver and copper. Lead and mercury are comparatively poor conductors of heat. Do metals also conduct electricity? Let us find out. Set up an electric circuit as shown in Fig. 3.2. You must have seen that the wires that carry current in your homes have a coating of polyvinylchloride (PVC) or a rubber-like material. Why are electric wires coated with such substances? What happens when metals strike a hard surface? Do they produce a sound? The metals that produce a sound on striking a hard surface are said to be sonorous. Can you now say why school bells are made of metals?